In February I Love Italian Food returns to Dubai with a brand new project and a week of events dedicated to Italian cuisine. 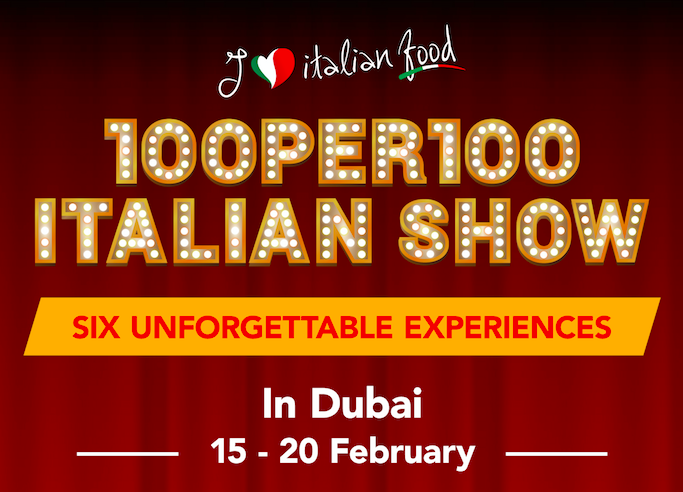 The appointment is from the 15th to 20th of February with the 100per100 Italian Show: events not to be missed, signed 100per100 Italian, in the most important Italian restaurants in Dubai to celebrate the real protagonists of our cuisine: the products. All during Gulfood, the most important food and wine fair of the Emirates. A calendar that will put in the spotlight the iconic products of Made in Italy entertaining the public thanks to 4 simple ingredients: an iconic product with its history to discover, a restaurant with its chef, a spectacular moment and an unforgettable dinner. The right opportunity for anyone who wants to live a unique experience, living for once a real Italian night, reviving its stories and flavors. We are waiting for you! All show performances by The Storytelling Company.